Another difficult day that has seen us travel far less than we would’ve liked. Today it was Jeans turn for a string of kitemares! It was really windy last night and although we were awake at 7am we decide to stay in bed to see if it calmed down. We left 10 days of food at depot B (our current camp) this morning. Jean and I both lost 20kgs from our pulks and Mark 10kgs. Around 2pm we set off in 25 knots perhaps a little beyond the upper limit of our smallest kites. Our planned route was to leave the ‘road’ at this point but that would require travelling directly downwind, which is tricky, so we decided to travel 10km further down the ‘road’ so that we could ease the downwind tack. Jeans first kitemare began at our first launch. But Mark and I waited with our kites in the air and then we all travelled at full speed on an increasing wind for 10km along the road. I filmed with the hand held GoPro gimbal until its battery died. We did the 10km in way less than an hour, but the increased speed and our lighter pulks meant we had a few capsizes today. By the time we got to point we planned to leave the road it was gusting to 30knts and the visibility had decreased. However the surface had improved considerably so we decided to push on. Kiting down the ‘road’ in 27 knots !! As we changed tack it was clear this was a bad idea. 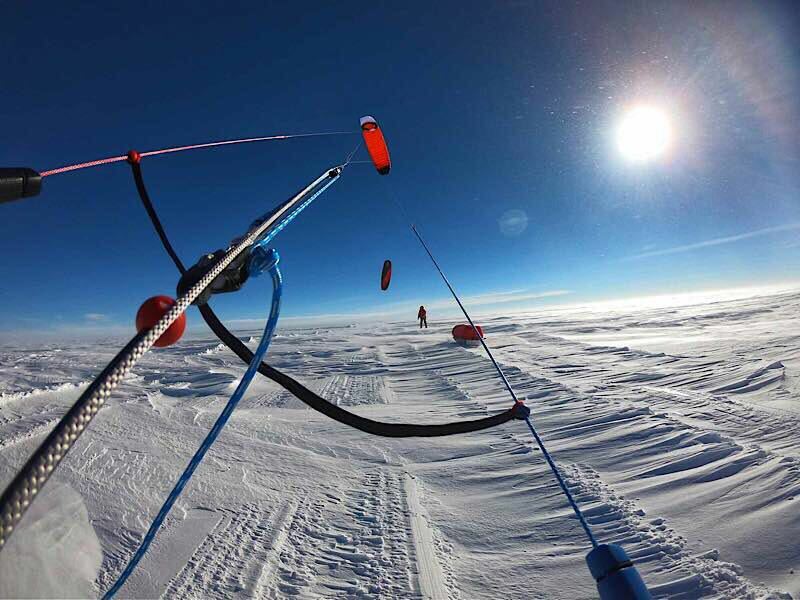 It takes a few kilometres to find the optimum way to fly the kite on a new tack and before we’d figured it out I’d looped my kite downwind which generates a great deal of power and shot like a rocket across the snow. My pulk flipped and at the same time so had Jean’s. Jean released his kite onto the 5th line safety which depowers the kite without losing it, but on these kites in so much wind, it led to another kitemare. We weren’t expecting the wind to be so strong out here. We are seriously regretting not bringing our really small kites that we left at Union glacier to save weight. 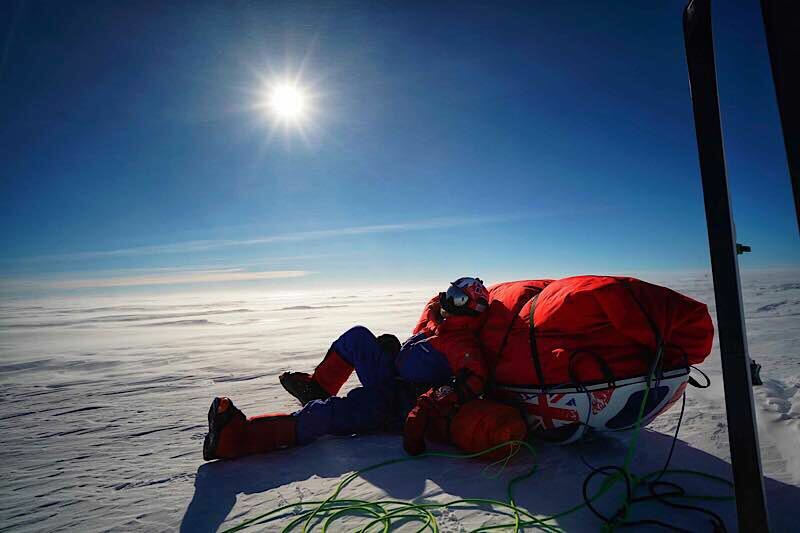 We are also regretting not taking the advice from several seasoned polar kiters who recommended bringing ski sails, a different kind of wind sail that are generally less efficient but better in very strong wind. The wind has dropped off now and the sun is shining. We are working well as a team and despite the slow, difficult progress, relentless cold and general hardship, we are having a laugh. I reviewed the footage from the GoPro and thankfully, although more than half of it was actually time lapses (doh! ), there were a few minutes of gold that will enable us to share something of the magic and power of the nature we are experiencing out here. Le vent est fort mais l’ambiance à l’air au top. Belle aventure, en espérant que Eole sera plus favorable pour la suite. Sounds really tough down there. Your kiting skills are getting a thorough test it seems. Hopefully the wind daemons will be more benevolent tomorrow. Great photos, which is nice for your audience at least! Hope you’re having “fun”, if I can call it that! Keep courage guys! Each kilometer is important! We’re following you every day and we’re sharing with you all constraints you’re meeting. But we’re also sharing all your good vibes and pleasure of adventure you’re getting! So much people here are proud of your courage and good spirit facing difficulties! Unbelievable that you have the energy left over after fighting your kites, your loads and the bitter cold to post su ch great photos and writeups! Riveting stuff. Fingers crossed for a big day tomorrow!